Drag with mouse to unveal the two different worlds. 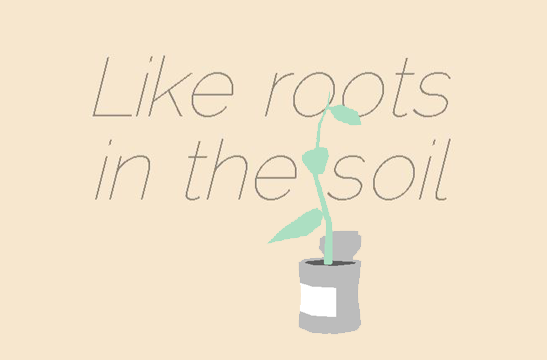 "Like Roots In The Soil is something new in a dusty genre." "It’s a really cool mechanic that is used to tell a short story about how the setting has changed over time, with some poetic writing and a happy ending." Its just a wonderful story with an amazing art direction, the music is mellow and suits both walks, yet you cant help but feel the silent story resenting inside yourself. This is a wonderful game, or even visual novel that everyone should at least experience once. Its mellow, peaceful and has a beautiful understanding of both sides of the world. Thank you very much, Atlas. We are always very happy when people likes the ending and we like to hear the thoughts about it. Hi!! just wanted to say that even if it´s short, this is a fantastic game, visually and the story too, great meaning behind it. Totally recommended !! Tnks for your video ! I played this recently, and although I didn't understand it, I enjoyed the experience. For some reason the older man reminds me of Joel from The Last Of Us. I did a let's play of it, if anyone wants to see some more in-the=moment thoughts. Hi there, I just wanted to let you know that that I played your game and I also made a let's play of it, I hope that's okay. I really enjoyed this short little game, I found it so touching and heartwarming and I really loved the mechanic. So thanks for making it. Thanks for your let's play NerdVine! This is amazing! I love the ending. How did you set up the rotating scene switching thing in unity btw? Basically the cycilnder shape is splitted in two different shader masks. Loved this! Such an iteresting mechanic, and two beautiful worlds in one! A short offering, but a must play! This game had such a much deeper meaning then it initially let on. I am not so sure if I completely understood the meaning. But it had me thinking much more about what I interpret everything to mean. I really love this both this idea and how it is presented. I would love to see this concept expanded into a larger game. I don't know why but this game nearly had me in tears XD the end just gave me a quick rush of emotions, really awesome game this was! well done on creating this! There isn't much to this game, but the elements in it were great. Loved how the world visually as well as audibly changes from side to side. Also really liked how the ending seems (to me) like it's open to interpretation. Great job with how the music changes between the 2 viewpoints - both extremes suit the visuals well, and are faded well as you move between them. The story it NOT what you think. I had such a relaxing time watching this game's story unfold; definitely a warm welcome and a breath of fresh air in the genre these types of games are usually placed in. The minimalism and low-poly art style oozes a certain light-hearted charm that you normally would find in most games, Thank you for this experience and I'll be on the lookout for future endeavors! I really like short narrative games & this was just fantastic. I really didn't expect that ending either! It may not be the longest experience ever, but I enjoyed every second of it and it kept my mind whirling. This was an awesome experience! Thanks alot for this game! You have a cool voice man! I've always wanted to do voice work, I'd be more than happy to re-record myself or just clean up my video audio for you if you'd like to use it. It would be perfect If you can re-record yourself, so we can try to put your voice in the game. Thanks CoalFire! I've sent links to the files, let me know if you need anything else! I'll be back to you by email as soon as possible. I loved the story and the concept of this game! I love the concept of this game! I wish it was longer! soooo nice. really nice idea. 5 at 5 star! Such a wonderful ideea, and the implementation is great! The extra effort in music is noted, and appreciated.